2012 Miss Universe 1st runner up Janine Tugonon is now making a name for herself in the international modeling scene after her beauty pageant stint. Janine, who is currently based in the US, has posed for various editorials and also ads for Wells Fargo and Walmart. 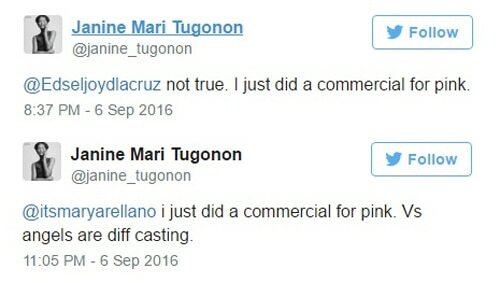 In her Twitter account, Janine however clarified that she is not a Victoria’s Secret Angel and was just a model in their ad. Janine also tweeted a thank you message for all the support and messages she has been receiving.